SEJ's 11th Annual Conference: Top Bush administration officials Christine Todd Whitman and Gale Norton outlined new environment and natural resources policies. Two conference sessions considered the impact of terrorist attacks on technology, the environment and environmental reporting. 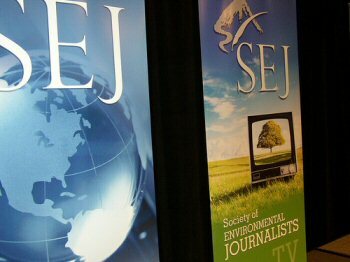 SEJ's 10th Annual Conference: Cars of the future; a debate between the environmental advisors to presidential candidates George W. Bush and Al Gore; keynote address by David Suzuki; author Bill McKibben. Hosted by MSU's Knight Center for Environmental Journalism. SEJ's 9th Annual Conference: Urban sprawl; Hollywood, the press and the environment, with panelists Ted Danson, Ed Begley Jr., and Keely Shaye Smith; keynote address by David Brower; and a Sunday morning talk by Barry Lopez, author of Arctic Dreams.